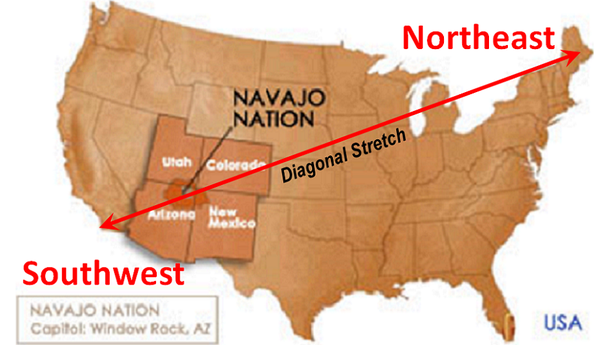 Navajo Post Reporter reported that a gigantic crack was forming in the earth on the Navajo Nation, just east of Flagstaff. The huge crack has grown so large that it had to be fenced off. On Saturday around 7:30 a.m., a house exploded blowing out several brick walls and lifting the roof briefly off the house. Sparks shot from the house and black smoke billowed into the air. A sinkhole opened around 10:30 p.m., rupturing a 30-in. irrigation line. Sections of the road sank into the sinkhole. Around 7:45 p.m., Northwest Fire District received about 100 calls in a 15-min period from a large area of the city reporting loud boom accompanied by rattling windows and shaking walls. In Glendale, a giant sinkhole, 12 ft. wide and several feet deep opened in the middle of intersection, forcing closure of northbound lane on 67th Avenue. A second sinkhole up to 15 ft. deep opened in Phoenix. Around 5 a.m. near the Utah-Arizona border in Navajo Nation, a massive sinkhole closed Hwy 89 in both directions. The 150-ft wide, 5-ft deep sinkhole, which caused pavement to buckle and collapse, was reported by two motorists who drove into it. Tucson Fire Department responded to explosive fire in a storage unit at about 9 a.m. As firefighters approached, a large explosion blew off the top half of a roll-up door. A huge sinkhole opened in the northbound lane of a busy roadway. The enormous hole, 60 ft. long by 30 ft. wide and 25 ft. deep damaged pavement and shoulder. A loud boom was heard around 1 a.m. About 5 minutes later, a second and then a third loud boom shook the area. El Centro in Imperial Valley, California, borders Arizona and Mexico. It is 113 miles east of San Diego, which also experiences loud booms and “strange odors. 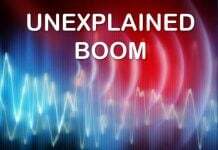 Loud booms are probably related to plate adjustments and they are heard all over the world in stretch zones areas like Arizona, where land is sinking as supporting rock pulls apart, creating a void . . . and boom, boom, the air above claps. 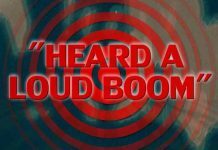 Thus, loud booms are caused by the heaving, dropping, and clapping earth, similar to the mechanism that produces thunder, clapping air masses. Stretch zones areas regularly experience not only loud booms and sinkholes, but also landslips and landslides, exploding and collapsing buildings, and huge cracks that split the earth wide open. Massive sinkholes have been on the increase in Arizona since well before December 2012. Unusual “geological events,” as they are now known, have become the new normal for Arizona. As you read up, two massive cracks in the earth have opened in different locations in the Navajo Nation – Feb 20 and again last week on Mar 19. Add to the mix a giant dust cloud, known as Haboob (Arabic for “strong wind”), that swept through the greater Phoenix area last summer. The Haboob, estimated to be about 600 meters (2,000 ft.) high, knocked out power, shut down the airport, turned swimming pools into mud pits, and caked cars with dirt. Are all these geologic events a coincidence? You be the judge! But you have to be fast!